Energetic young adults from Change the Triangle have certainly changed Jordan Lake for the better. On Saturday morning, June 16th, 45 came to clean up trash for Clean Jordan Lake and then to enjoy social time together with a picnic and overnight camping. This was their third annual community service with Clean Jordan Lake. The volunteers boarded a pontoon boat operated by Stephen Harrison of the U.S. Army Corps of Engineers and were ferried from Vista Point to a badly trashed inlet about 3 miles south. This site is on the opposite shore from Wilderness Island where they and many other volunteers have worked before. It took a while to get all the volunteers in place but the boat ride was fun. 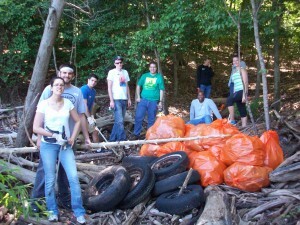 Even more fun was filling 130 bags with trash and rolling 60 tires to the shoreline for pickup. They completely cleaned the assigned inlet and even more! In three volunteer efforts so far, 92 members of Change the Triangle have participated, removing 240 bags of trash (that's about 2.4 tons!) and 145 tires. THANK YOU!